I'm letting you in on a secret. I don't use pine nuts on my pesto. Yes! I hope I have not defiled any cooking gods or broke culinary laws. I'm just one frugal mommy who loves making pesto sauce and cooking with it, cause I can't deny my love for it and I have lured my family in the same way. So, what's the big deal in omitting pine nuts? Well, for one, it's expensive. 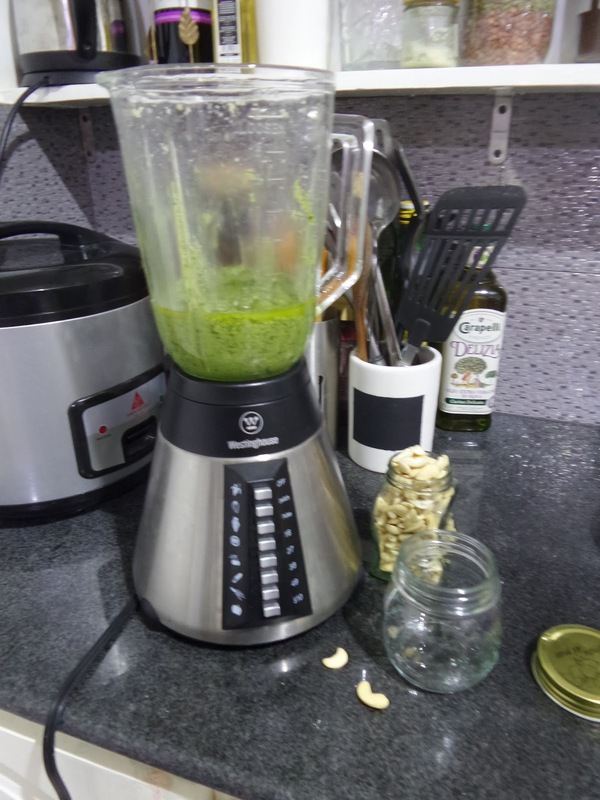 Back in the days when I never knew about using different nuts for the pesto recipe, it would cost me P 200 for a half cup of pine nuts and I have to keep it away my sight, else it wouldn't make it home. The traditional way of making pesto is using half a cup of pine nuts along with other expensive ingredients like EVOO and Parmesan cheese. Italians would ground everything up with a mortar and pestle. I could just imagine the aroma of the herbs being infused into the nuts and how everything fuses up though it would take more of your energy and time. Now that you know that I don't use pine nuts anymore (though I'd still opt to if it's more affordable) let me tell you what I use in replace of it. Surprise! Yes it works and it's fool-proof. Though I kinda roast it to brown on fire first before I ground it with the other ingredients, but you may opt not to, specially if pressed for time. Also, cashew is less oily than the pine nuts but gives out the same texture and nutty and woody flavor in the pesto. cut to the chase and share you my recipe...Enjoy! Combine half of the basil with the nuts, cheese, cloves, and salt in a blender or food processor. Blend continuously until the ingredients are finely chopped. Scrape down the sides of the bowl and add the rest of the basil. Blend until a uniform paste has formed. Scrape down the sides of the bowl as needed. With the blender running, stream in the olive oil. Less olive oil will make a paste good for spreading on sandwiches and pizzas; more will make a sauce better for pastas and stirring into soup. 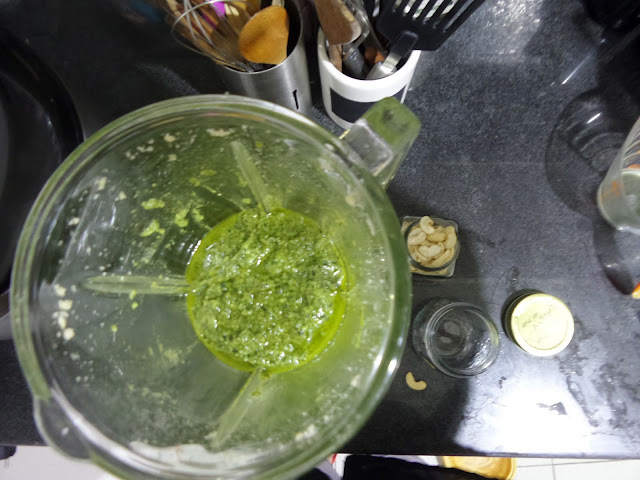 Scrape down the sides of the bowl and continue blending as needed until the olive oil is emulsified into the basil and the pesto looks uniform. 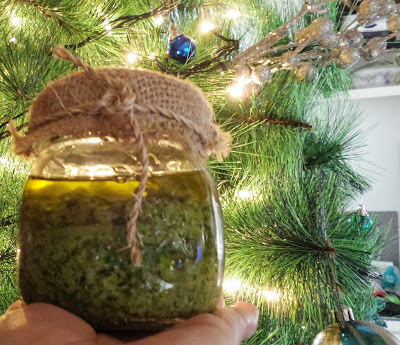 Taste the pesto and add more salt, garlic, nuts, or cheese as needed to taste. Pesto will darken and brown very quickly, but will still be tasty and fresh for several days. For best appearance, use it right away. 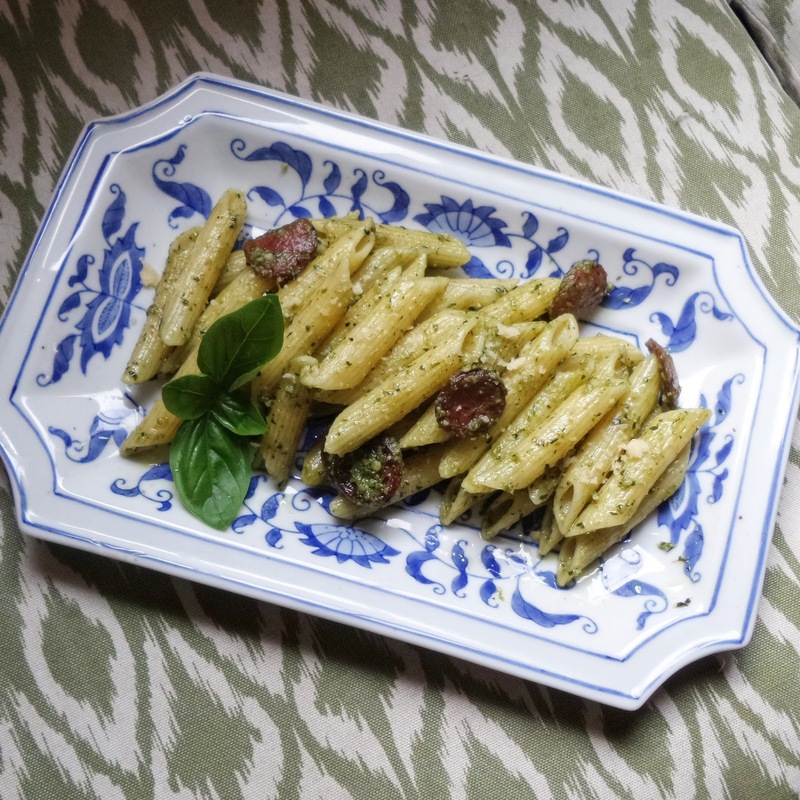 If storing, store it in the smallest container possible and thoroughly press the pesto to eliminate air pockets. Pour a little olive oil over the surface, cover, and refrigerate for up to a week. 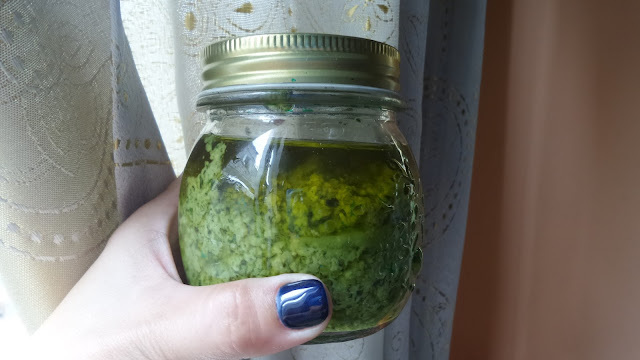 Pesto can also be frozen for several months.